In politically turbulent Renaissance Florence, the admirer of a beautiful, married noblewoman changes her life when he commissions a young Leonardo da Vinci to paint her portrait. 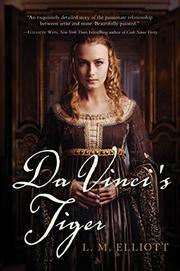 Ginevra de’ Benci, 17, spends her dull marriage to an older wool merchant reading, writing poetry, and socializing. She benefits from her family’s long-standing ties to the Medicis, especially Lorenzo, who introduces her to Bernardo Bembo, the handsome ambassador from Venice. Smitten, he commissions her portrait from rising artist Leonardo. Vows of platonic love notwithstanding, Ginevra finds Bernardo’s lusty pursuit anything but abstract. It’s Leonardo, who engages her as an equal, who attracts her, however. Readers will learn much about 15th-century Florence, but meticulous research does not make a novel. For that, characters are needed whose desires, fears, gifts, and foibles drive the story, whom readers can believe in and care about. In the confusing prologue, Ginevra addresses modern readers, explaining her portrait’s significance in an art-historical précis. Thereafter, brief spurts of dialogue are separated by long paragraphs of unleavened exposition as Ginevra steps out of character to offer historical analyses and tangential facts, such as how left-handedness has been treated over centuries. The book’s second half may well engage readers willing to hang on that long.